traditionele vingerprik met de meting van glucose in traanvocht, direct in het oog. Een revolutionaire uitvinding voor patiënten met diabetes. 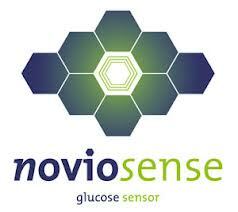 Chris Wilson, directeur NovioSense: Het is uiteindelijk de bedoeling dat onze glucosesensor wordt uitgelezen door middel van een smartphone. Om dat te realiseren denken we bij Novio Tech Campus het netwerk en de juiste technologie te vinden. Doel is dat we de sensor in 2017 naar de markt brengen”. For the ultimate comfort in continuous wearing of an ultrasound monitor, extreme miniaturization is required. To this end, a complete ultrasound transducer will be integrated into a tiny silicon chip. We call this extreme miniaturization ultrasound-on-a-chip. Using this new technology, a complete ultrasound monitor will consist of an IC (integrated circuit), a transducer (ultrasound-on-a-chip) and a battery, packaged in a skin patch to facilitate the best contact to the user. This extreme miniaturization will revolutionize the use of wearable ultrasound applications. For the development of the ultrasound-on-a-chip technology, Novioscan benefited from a subsidy of the European Union via the “Europees Fonds voor Regionale Ontwikkeling”.